LG confirms UK release date for G Flex curved phone | What Hi-Fi? 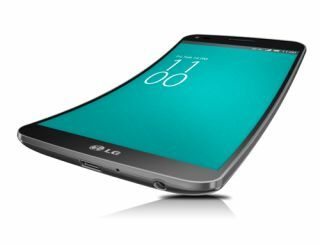 LG has confirmed that consumers in major European markets – including the UK – will be able to get their hands on the long-awaited, curved LG G Flex smartphone from next month. The LG G Flex – described as the world's first smartphone designed to follow the curve of the human face – is currently only on sale in Korea, Hong Kong and Singapore. LG has used flexible OLED technology in the development of the LG G Flex, which has screen curvature ranging from 7.9mm to 8.7mm in thickness at various points. The Korean firm says this will improve the smartphones' ergonomics during phone calls and also provide a more engaging experience when watching videos. That's the theory, at least. The 1280 x 720 HD screen measures 6in diagonally, while the phone also boasts the world's first curved battery (naturally) and UX features such as Swing Lockscreen. And if the curvature of the phone wasn't innovative enough, the phone is said to be the first to include a "self-healing" coating on the rear that is designed to make it immune to minor scratches and nicks. Qualcomm's Snapdragon 800 processor running at 2.26GHz will power the phone, as well as 2GB of RAM. Other features include a 13MP rear-facing camera. Dr. Jong-seok Park, president and CEO of LG Electronics Mobile Communications Company, said: "The introduction of the LG G Flex in Europe demonstrates our confidence in the global marketplace for a curved smartphone." EE has already said that it will be offering the LG G Flex, but has yet to confirm tariff prices. Meanwhile, Carphone Warehouse lists the phone as being available on O2, with up front costs from £49 and pay monthly tariffs from £52. News of the LG G Flex's imminent UK launch has come just as reports suggest that LG will also be launching two further smartphone models – the LG G2 Pro and the G3 – during the first half of 2014. Industry sources quoted by Korean media said the G2 Pro may appear as early as next month, with the G3 following in May. The LG G2, which received five stars from us, has only been on the market for a matter of months. With these latest announcements from LG and fresh details of the Samsung Galaxy S5 starting to emerge, we're listening out for the all the latest news to emerge from Mobile World Congress next month with great interest!